Call (800) 777-0202 or email us today to get a quote or request a sample of our Anti-Scratch Felt Pads. Frank Lowe's die cut anti-scratch felt pads are offered in an array of shapes, thicknesses & colors. Regularly used in point of purchase & display market, Frank Lowe will help you explore, pursue & create better with anti-scratch felt pads. Since 1955, Frank Lowe has been continually recognized as the leading custom manufacturer by offering quality custom anti-scratch felt pads. We'll use our decades of experience to work to understand your needs and guide you to the best and most effective anti-scratch felt pad solution. We regularly partner with companies in the point of purchase industry and display market to provide custom die cut anti-scratch felt pads. Even so, we can provide custom anti-scratch felt pads for any industry with or without our pressure-sensitive, adhesive backing. Whether you need die cut anti-scratch pads for a point of purchase display or for virtually any other use, Frank Lowe offers custom die cut solutions to meet your needs. 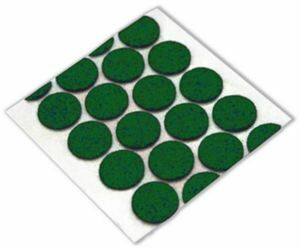 Our equipment and highly trained custom manufacturing professionals can provide die cut anti-scratch felt pads in circles, squares, rectangles, or any custom shape you can imagine. Even if you don't already have design specifications in mind, we can help. We can work closely with you to understand your application and guide you to the most suitable die cut felt pad solution. We will walk you through all of your options including different felt pad thicknesses and colors. To help ensure you make the best decision for your application, we'll even send you samples of different die cut felt pads in varying shapes and thicknesses. Simply put, Frank Lowe's expert design and custom manufacturing team will be with you throughout the entire process — working to add value along every step of the way. All of our anti-scratch felt pads can be laminated with a pressure-sensitive adhesive. This speciality adhesive is designed to provide a reliable bond to a vast range of surfaces. Most importantly, this specialty adhesive doesn't require the use of heat or any other special application methods. Instead, you simply peel off the backing from your anti-scratch felt pad and stick it on the desired surface. The applications for die cut felt are almost limitless. Our team of custom manufacturers regularly partner with point of purchase companies and help them create unique and attractive retail displays. For more than 60 years, Frank Lowe's team of POP display manufacturers have delivered anti-scratch felt pads for retail display components. We'll use our extensive experience to help you explore, pursue, and create more and better solutions. Whether you've been producing POP displays for decades or are looking for new ways to use anti-scratch felt pads with your products, it's never too early or late to partner with Frank Lowe. We'll work to provide the solutions to help you achieve your goals. Interested in Anti-Scratch Felt Pads? Fill out the form below to request a free quote! Are You Using Anti-Scratch Felt Pads For Your Product Application?